“Palacia Phase II” is an ongoing project by Madhav Shreeji Constructions Group that is presenting a thoughtfully developed project with the best surroundings at Hiranandani Estate, Thane West, Maharashtra. These apartments are especially created for offering a refreshing new life in the cozy environs of your own dwelling. This project designed in a total area of 8 acres whichis a concept with the refined line of distinction from others.The Apartments are majestic, well ventilated and Vastu compliant. Palacia Phase II is a landmark residential project which is being developed over 8 acres of land. It is offering multiple flats for sale including 2 BHK and 3 BHK in various sizes where 2 BHK has a carpet area of 644 sq.ft and 651 sq.ft. 3 BHK has a carpet area of 801sqft. The developer has designed total9 Towers in Palacia with approx 700 Flats. 6 Towers of Stilt + 16 Storeys each& 3 Towers consists Stilt + 19 Storeys each.This plush project truly aims at providing a luxurious life style with the comfortable settings. The locality of Palacia Phase II is well linked to several parts of Thane through the public transport network and important roads. Chhatrapati Shivaji Railway terminal is about 39 Kilometers away from the project location.The project has easy connectivity to the nearest cities and Eastern Express Highway. The availability of public transportation creates a sigh of relief for the residents.It also fulfills the need of religious people by having places of worship in the area.The location also fulfills daily needs like grocery shops, pharmacy stores in and around Hiranandani Estate. 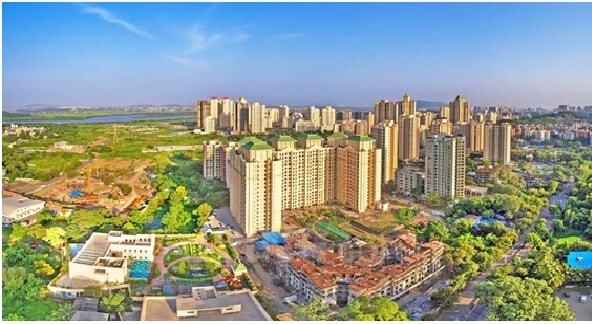 Palacia Phase II is a landmark residential project being developed behind Hiranandani Estate, Wagbil Road, Thane west. At Palacia Phase II, there are multiple amenities on offer for residents which includes Club House, Landscaped Gardens, Smoke Heat Sensor, Gym, Swimming Pool, Play Area, Ac Common Area, Ac Waiting Lobby, Furnishing, Roof Terrace, Indoor Games, Video Surveillance & Jogging Track. Hospitals: -Hiranandani Hospital, Madhavbaug Clinic ( Ghodbunder ), Kevalya Hospital, dentech dental clinic, Currae Hospital. Schools/Colleges: -SaraswatiVidyalaya High School & Junior College, Hiranandani Foundation School, Arunodaya Public School, Arya Cambridge International School, My World Day Care Center and Pre School. Shopping Malls: - MK Plaza, Big Shopping Center, Global Home Decor (INDIA), Arcadia. Restaurants: -Mcdonalds, Lemon and Spice, Cafe Coffee Day, Pirates of the Kitchen, Chilly Restaurant. Bank/ATMs: -State Bank of India, HDFC Bank, Axis Bank ATM, ICICI Bank ATM. Parks: -Hill Grange Garden, Nisarg Garden, Hiranandani Park, Princeton Polaris Ground, Middle Park. Pharmacies: - Matoshri Medical, Raj Medical & General Store, Navjeevan Medical & General Store. Railway Stations: -Thane Railway Station, Mulund Railway Station, Kalwa Railway Station.